Bio-Kleen Amazing Cleaner is a biodegradable, non-toxic all purpose cleaner for deep cleaning of vinyl, leather, fabric, carpet, canvas, mold and mildew on boats and RV and anywhere around the home and garage. 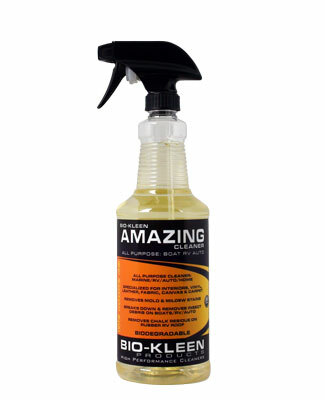 Biokleen Amazing Cleaner literally excels at nearly every cleaning application. Is Bio-Kleen Amazing Cleaner the best cleaner on the market to clean Marine, RV and Auto Vinyls, Leathers, Fabrics, Carpets and complete interiors? - Yes. Is Bio-Kleen Amazing Cleaner also the best All Purpose Cleaner for your home and garage; and can replace a multitude of cleaners you currently use? - Yes. Can replace a multitude of cleaners for your home, garage, boat, automobile and RV.